Your floor is one of the things that catch people’s attention when they enter your home. That is why many people invest in great flooring. Qualls Chem-Dry specializes in carpet cleaning. However, we also provide cleaning services for other flooring types, including vinyl. Many homeowners love vinyl floors and with good reason. Vinyl has some similar qualities to linoleum. Technological advancement has led to the development of very creative and economical vinyl floors. Here are some of the benefits of vinyl flooring. Vinyl flooring is one of the most durable floorings. Also, the flooring can take the pressure of heavy foot traffic. You can have vinyl flooring in your home for around 10-20 years before replacing it. However, how long the floor lasts is subject to the quality of material and the method of manufacture. For example, fiberglass is more durable than printed vinyl. 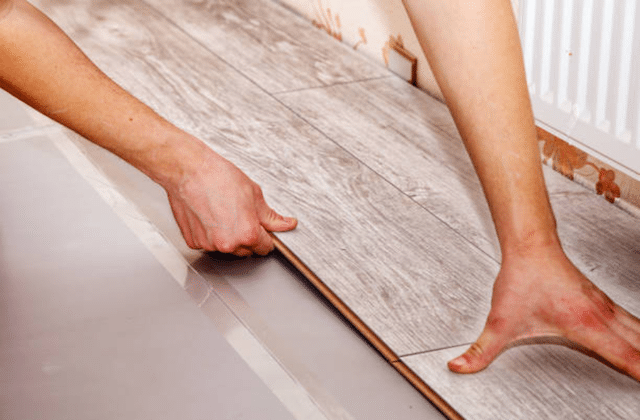 The fantastic thing about vinyl flooring is that you don’t need to replace the entire area if a particular area is damaged. You just need to replace the individual pieces that are damaged. Vinyl flooring is more comfortable to step on compared to ceramic tile or wood floors. The flooring does not become cold even during the cold months and is therefore ideal for homes. Also, some vinyl flooring are extra comfortable because they have a padded underlayer installed beneath the tiles and sheets. Therefore, your feet will feel very soft beneath them. Some people opt for vinyl because it is inexpensive. A square foot of vinyl can go for approximately 50 cents or slightly higher. However, if you want the very high-end premium ones, be ready to part with about $10 for one square foot. When you compare it to other premium flooring options, it is still cheaper. The low cost of vinyl makes it easy for homeowners to place it in places with heavy traffic compared to having hardwood floors. These areas may need a lot of vinyl because their floors need to be repaired more frequently than other areas. Examples of such high traffic areas include the hallway or mudroom. One of the best qualities of vinyl is the fact that it is waterproof. That is why homeowners have it in wet places like the bathroom, laundry rooms, and kitchens. If you don’t want flooring that requires complex cleaning procedures, then vinyl is the way to go. The fact that they are resistant to both water and stain means they do not have much dirt left on them. Vinyl flooring is also hygienic because they do not make room for bacteria to breed. You can just clean it with a damp mop and sanitize with your choice of sanitizer without damaging your floors. It is advisable first to sweep the floor to get rid of any grit or dirt. You can install vinyl flooring on your own because they do not require much work. The flooring comes in planks and sheets which require you to peel and stick it on the ground. Therefore, this is something you can do. Before you get started, make sure the level subfloor is completely dry so the vinyl can stick properly. However, it is not a bad idea to get professional help to be sure of excellent work.